At one of the American Mountain Guides Association Single Pitch Instructor Provider continuing education programs, we discussed the strength of trees. One SPI provider noted that he had pull tested a tree to failure with a load cell and found that the tree had a 17kN value. 17kN is a decently high value. A kilonewton (kN) is worth approximately 225lbs. And most carabiners and slings are rated at 21-24kN. 17kN isn't quite high enough for a stand-alone anchor, but it is plenty high enough for a rappel or for an anchor component. Just how good is that tree in the crack? As soon as the provider finished speaking, several people challenged him. "That rating was only good for that tree at that spot," one person said. "It's all about the root system," another said. "You can't tell anything with one test," a third said. A few weeks later I attended the International Technical Rescue Symposium. The symposium brings together some of he best minds in rope rescue. Many participants do research and present papers at the event. At this particular symposium John Morton, a rescue technician from Everett Mountain Rescue and the Snohomish Helicopter Rescue Team, presented a paper on the kN value of trees. Morton started working on determing the values of trees some years earlier with Mark Miller, a mountain guide and rescue instructor who was tragically killed in an accident early in 2015. After Mark's death, Morton continued to work on this project. Essentially, he came at this problem in a new way. He looked at trees as anchors that have already been tested...by the wind. When there is a windstorm, trees are seriously stressed. Indeed, they are tested just like any other piece of rescue or climbing equipment. They act almost like a sail and capture a tremendous amount of wind. If they don't fall over, then they've been tested to a certain level of kN. Morton took this and developed a formula based on a combination of tree species profile and how windstorms impact those trees. In the process he further refined his formula to accommodate for trees on the lee side of hills. And when he was done... He had a means to actively give every tree everywhere a kN rating. The preceding shows the circumference of several trees in the Pacific Northwest and their kN rating based on Morton's formula. For a rappel anchor, we probably want something that has a minimum value of at least 8kN. Leader falls are often given a value of approximately 7.5kN, so while a rappel shouldn't provide that kind of impact, we should be prepared for it. For a climbing anchor, we want something with a minimum of 20kN. And for a rescue anchor, we should probably have at least 30kN. 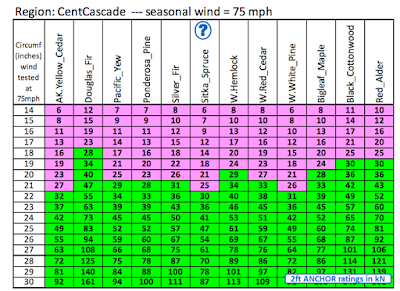 By these figures, every tree in the PNW that is at least 22-inches in circumference is adequate for a climbing anchor. And every tree that is at least 25-inches in circumference is adequate for a rescue anchor. For SAR personnel, Morton recommends carrying a field guide so that you might be able to look specifically at a given tree species and determine how small you can go. This is really cool work. To see Morton's complete paper, please log onto http://itrsonline.org/papers/ and search for John Morton, "What if Trees had Ratings in kN? 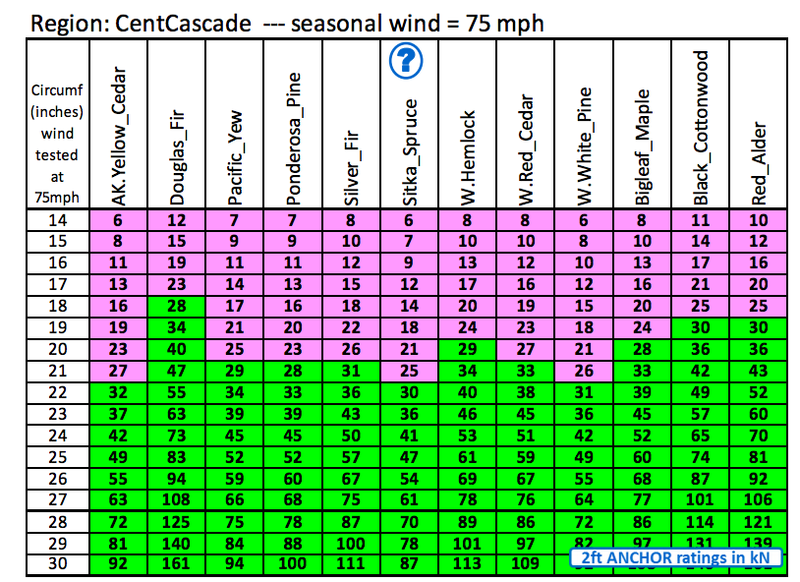 Tree Anchor Ratings Based on Wind Loading." "By these figures, every tree in the PNW that is at least 22-inches in diameter is adequate for a climbing anchor. And every tree that is at least 25-inches in diameter is adequate for a rescue anchor." The study shows trees measured by circumference, not diameter. So, you're off by a factor of Pi. It appears that the table lists circumferences and the words refer to diameters. That's a huge difference. Thanks for pointing that out, guys. I have adjusted the language. It's not clear whether these numbers represent a minimum or an average. If it's an average then assuming any tree of a given circumference will have the strength recorded in the table is not correct. @Joe Keyser - These would be minimum. We know that they survived a storm of a certain value. They certainly could be stronger than the minimum though. Is this at 2 feet above the bottom of the tree? How would putting the anchor at the ground change these numbers. It should decrease the force due to torque on the root system. I would consider it an additional factor of safety on these numbers. I would avoid anchoring above the 2 feet if at all possible and stay as low as reasonable in the given anchor situation. Although this is a claim to universality, I have once in my career come across a tree that did not fit into this chart, on the danger side. After climbing a long route at Huckleberry Mtn. in the Adirondacks, I anchored to a very large white pine tree, a tree so large it took two double runners and a full length to wrap around it (that is at least a 96" circumference, assuming the normal length runner was used to clip myself in, not add to the length; I don't recall precisely). Whilst belaying my follower, I gradually became aware that, with every whisper of breeze, I was moving; a gentle, rocking forward and back motion. This particular white pine was growing on a ledge, but its roots could not gain deep footing anywhere. Whatever had anchored the tree had broken, and the entire tree, rootstock, and soil it grew in, was rocking toward the abyss. I was suddenly not so assured of my anchor. That tree was hanging upside down on the cliff the next time I visited the area. So while at one time, that tree was likely well within tolerance according to this chart, a few minutes of observation would've revealed an alarming lack of security.